Yeah, we hear all the time that we have to teach our kids all about eating healthy and practicing healthy habits that will hopefully stick with them for a lifetime. But the question is, why? What are the potential dangers of not teaching those little guys and gals about being healthy and making the right food and activity choices? If our children aren’t exposed to healthy habits from their parents or other influential adults early on, they only have a few other people to rely on for lessons on how to take care of their bodies. Those other people are going to be their peers, media, teachers, and maybe some sports coaches. Let me just tell you that the lessons they will learn from their peers and the media regarding body image and food are not the lessons you want them to learn. Your daughters will grow up believing they have to be stick thin and eat just carrots and no sugars or white bread unless you instill healthy habits right off the bat from the time they’re born. If you don’t get kids used to a certain lifestyle, do you think they are going to want to change and try something new when they’re 13 and full of teenager attitude? I think not. Unless they have been used to playing outside and running around with you from the time they learned how to walk, it’s probably going to be hard to get them to want to get up and be active later on in life once they’re twenty-five pounds overweight and have figured out how captivating the Playstation can be. And do you really think that after serving Hamburger Helper and corn dogs every night, they’re going to get excited about spinach and kale quiche? Yeah, most likely not. These reasons are why we start now. Use these few ideas to get yourself on the right track to teaching your kids about healthy relationships with food. As the saying goes, Monkey see, Monkey do. If you have kids now, you know how much they copy you, especially at a very early age. 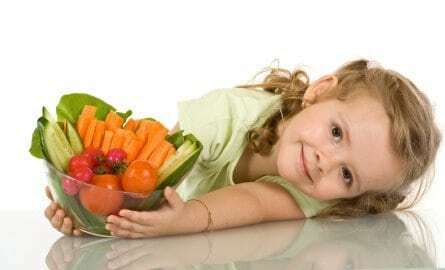 If you eat your carrots with a happy smiling face, talking about how yummy they are, your chances of getting your kiddo to try them out are probably quite a bit higher than if you were to take a bite of carrots with a disgusted look on your face as you’re trying to choke them down. This also falls under the “lead by example” topic above. Think about it. 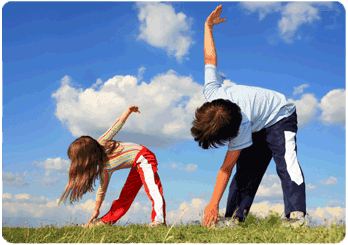 You can’t expect your kids to want to be active and run around if you’re lazy all the time. If you’re doing things like going to exercise classes, running groups or races, or Jillian Michaels DVD’s, your kiddos are just going to think that’s a normal and healthy part of life. ‘That’s what adults do. They workout. When I get older, I’ll do the same thing.’ And of course, if you’re doing an exercise routine that your kids can join in on, by all means, let them downward-dog right next to you! Besides, it’s really cute when they’re young and trying to follow workout moves. A little cake. and a little salad. A little ice cream sundae. and a little tofu. I think this is one of the most important tips I can give you. Food deprivation in any way is just detrimental. If you tell your kid they can’t have McDonald’s chemicalchicken-nuggets every single time they ask, what do you think is going to happen the second they get a bit of freedom? Yes, they are going to drive to the closest golden arches and order one of everything on the menu. And they’re going to do it more than once. Probably until they’ve gained their freshman 15 (or 30) and then end up having to crash diet for sorority rush parties. Once again, you need to start early on this one. Show your kids how fun it is to help make some of their favorite foods. They’ll grow up being able to cook just as good as their mom did. I’ve actually made a video segment that shows just this, my son in the kitchen with me once a week. This teaches kitchen skills, creativity, confidence, and independence. This also teaches them about healthy foods as they’re making them. Check out “Cooking with my Kid” for some fun ideas. As a parent, it is important that we build our kids’ self-esteem, not break it down. Tell them how beautiful and handsome they are often. Let them know they are powerful individuals who have the ability to do anything they want in this world. If they are a little soft around the edges or have an imperfection here or there (we all do! ), do not let them know that you notice these things. Regardless of their shape or size, they are still beautiful. Chances are, they are already feeling self-conscious about something on their outer appearance, and you mentioning that you notice it as well will just make it that much worse to them, especially if you’re dealing with a pre-teen. Be aware. Be sensitive. Don’t suggest they go on a diet. Do suggest a game of touch football after dinner. Or what about a bike ride? These are things you can incorporate without implying that someone needs to lose weight. In conclusion, these are some easy ways we can get our kids headed in the right direction when it comes to living a happy and healthy life. Keep their self-esteem high. Eat and be active in a way you would want your kids to, because they’re watching you every step of the way. They look to you for guidance. Our kids are like putty – very pliable and easy to mold. This ability to mold them won’t last forever, unfortunately. Act Now! What a BEAUTIFUL blog!! I love this place!! And I totally agree with your post. Teaching our kids how to have a healthy relationship with food is one of the most important gifts we can give!! Thank you so much Rochelle! That means a lot to me, coming from such a successful blogger, as yourself! I completely agree with what you said. I would imagine, it’s SO easy to really mess up someone’s relationship with food just by accidentally passing on your own personal issues. It’s so important to put those issues aside and realize you have a young being who gets to start from scratch! What a gift! I just twitted about your post. Very informative! You are so right. What we teach our kids stays with them always. I remember when I was growing up we had to clean our plates because of the starving children in Africa. I’m not really sure how me cleaning my plate helped them, by the way. When my kids were growing up, they had to try everything and they had to eat whatever vegetable was on the table. We didn’t make them clean their plates though. I think it makes a lot of difference. They know when they are full and they don’t overeat now, as adults. Sometimes I do overeat because I still hear about the starving children in the back of my head. This is a great post. I’m going to pin it and Tweet it. Thanks.